This is our part two of the Professionalism 101 series.We are covering interviews this time. Last time we discussed the ins and outs of resumes and CVs. You presented your polished resume/CV and now you have a job interview. Do not panic. We have help from TWU Career Services once again to help you prepare for a successful interview experience. Review their valuable information to get on the right track. 1. What should I wear to an interview? For women, suits, tailored clothes in classic designs and neutral colors are best for interviews. Skirt lengths should be moderate – not above the knee nor ankle length. Wear clean medium to low heel shoes. If you wear jewelry, keep it modest and to a minimum. It is suggested that you do not wear perfumes or after-shave lotions to the interview. Hair should be clean and neat and hairstyle should be professional. For men, a suit or jacket and slacks in a neutral color (gray, navy, black, beige) with a well-coordinated tie and polished black or brown shoes is always appropriate. 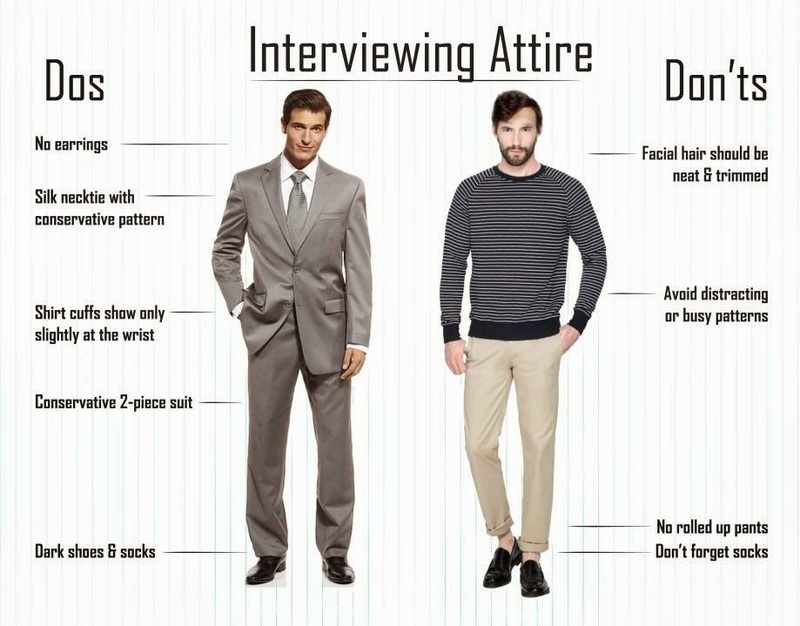 See the pictures below for the interview attire dos and don'ts. 2. What are the most frequently asked questions during an interview? Tell me about a difficult scenario at work and how you dealt with it. To review further interview questions, please check out https://twu.interviewstream.com/default.aspx. 3.Would a thank you email be just as effective as a thank you card? A thank you email can be just as effective as a thank you card. There are a lot of pluses when sending a thank you email. For one, you can send it the day of the interview to show how eager you are. It’s important to send a thank you note within 24 hours after the interview, while you are still fresh in the interviewer’s mind. Usually with handwritten thank you cards there is a delay and the possibility that it may not make it to the interviewer. Secondly, with a thank you email the interviewer may be more likely to respond to your email, ask you a follow-up question, or continue the conversation. In the end, it may not matter too much if you write a thank you email or a thank you card, as long as you made the effort to take some time to reflect on the interview and thank the interviewer for the opportunity. 4.What services does your department provide for interviews? We provide various services to assist students and alum practice their interviewing skills. Students can schedule a one-on-one mock interview or a telephone interview with a Career Services staff member. Students can also utilize InterviewStream, an online program that simulates the interview experience, and allows them to practice their interviewing skills anywhere, anytime. The instructions are listed on the Career Services webpage: http://www.twu.edu/career-services/practice-your-interviewing-Skills.asp. 5.What should I do before the interview? Preparation is key; the better prepared you are the greater your success during the interview process. Research the company; it’s not uncommon for the recruiter to ask “Tell me what you know about our company” Discuss their products, services, customers, reputation/image, organizational structure, employees. It’s not necessary to discuss all but do have a clear understanding of who and what the company is and does. Understand and research as much as you can to learn about the position. This will help you to understand and articulate how you can be an asset to the company. 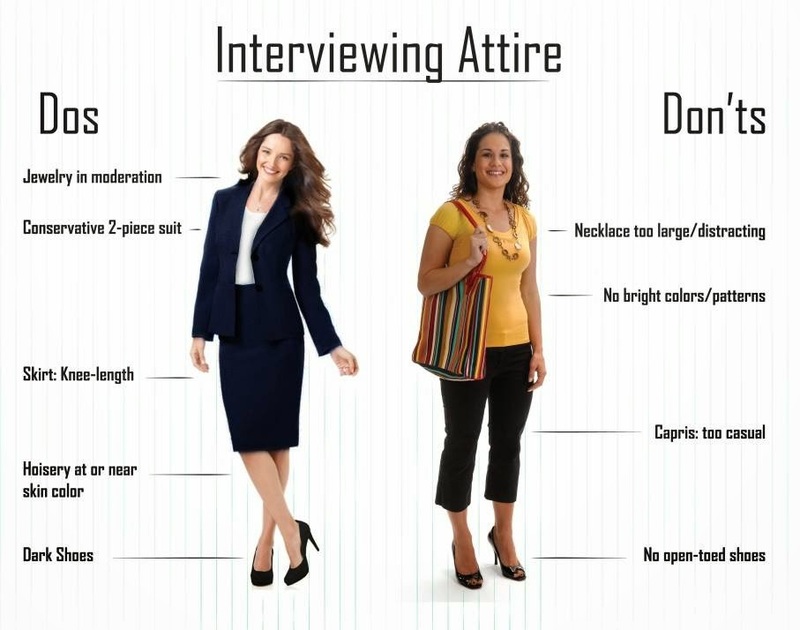 Organize and prepare what you plan to wear to the interview; conservative attire is always the requirement. Prepare questions to ask the interviewer. At the end of an interview, the recruiter will ask “Do you have any questions”. Your answer should be “Yes, I do have questions prepared.” This makes you look interested, prepared and it reinforces to the recruiter that you are organized and have time management skills. Drive to the interview location beforehand so that you can get a clear understanding of where you are going and the traffic patterns. You Do Not Want To Be Late For An Interview!!!!! 6. What should I bring to an interview? 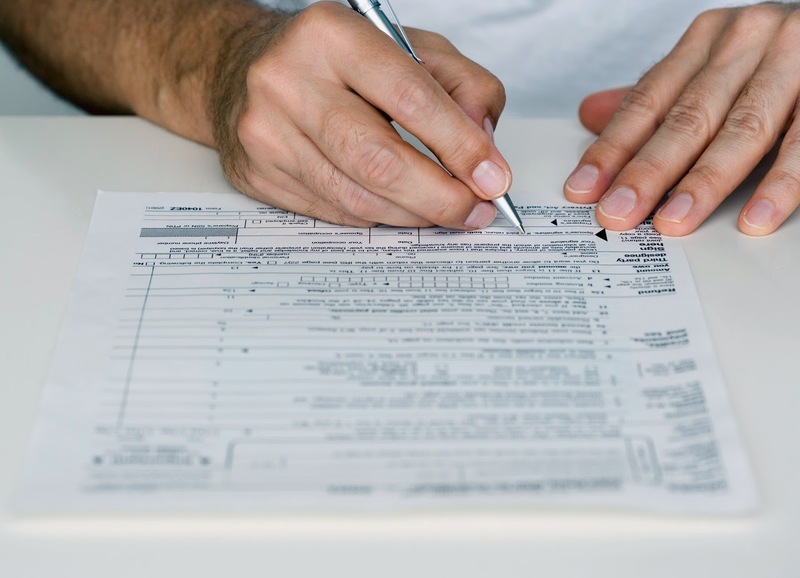 You will need, extra résumés, paper/pens, list of references, and required documents (social security card, driver’s license, copies of certifications, portfolios are examples). 7. What should I not bring to an interview? You should not take your cell phone, or any friends, children, family members, spouse, girlfriend, boyfriend or pets. 8. How can I better prepare for an interview? With your TWU email address and a web cam, practice interviewing by using InterviewStream at www.twu.interviewstream.com. This software will give you a video of your mock interview for review and to share with others to receive their feedback. You are able to practice as many times as you would like. Mock interviews are also available with Career Services Department, appointments required. Be enthusiastic, energetic, honest, and show interest. Be pleasant, friendly, courteous, flexible and tactful. Maintain good eye contact and greet with a firm handshake. Listen carefully and answer the question asked. Do NOT discuss personal information or issues. Being married with kids has nothing to do with how competent you are and this information may be used against you screening you out as a possible candidate for the position. Keep answers brief and to the point unless specially asked to elaborate. Thank the recruiter for the opportunity and ask what’s the next step in the interview process. ASK FOR THE JOB! – What I have learned today during this interview process has reassured me that (Company’s Name) will be an exciting company for me to (start or advance) my career. I would love to be a member of your team! 10. What should I do after the interview? Obtain the interviewer’s business card. Assess what you did well and what you would like to improve on for future interviews. Use the information from the interviewer’s business card to send a Thank You Letter. This will ensure that you have the correct contact information, that you spell the interviewers name correctly and use their appropriate title. If you do not hear from the interviewer, conduct a follow up telephone call or email to inform the interviewer of your continued interest in the position and to inquire about the status of your application. Also ask if there is any additional information that you can provide. If you need more help finding job, writing a resume, or practicing your interview skills, feel free to contact the TWU Career Services Department. They will be more than happy to help you achieve your goals. Thank you to TWU Career Services Department for their help in writing these blogs on professionalism.